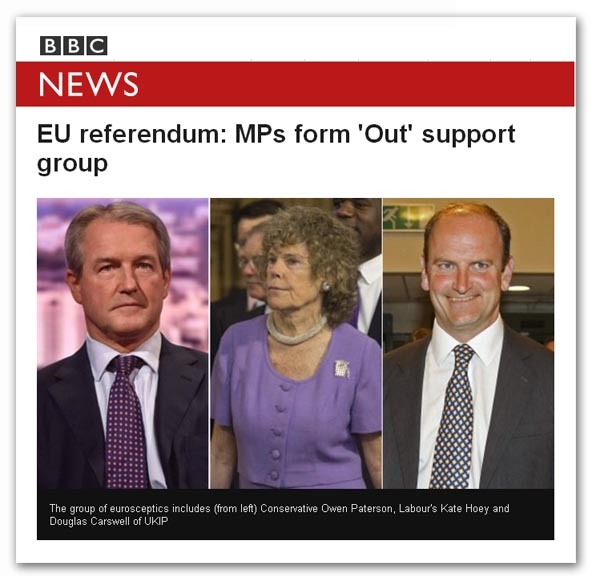 As reported by the BBC, a cross-party group of seven MPs have formed an “Exploratory Committee” for the EU Referendum. They comprise Steve Baker, Douglas Carswell, Kate Hoey, Kelvin Hopkins, Bernard Jenkin, Owen Paterson, and Graham Stringer.The MPs are listed in alphabetical order and media enquiries are being directed to Kate Hoey, (Chair, Labour for Britain) and Steve Baker (Chair of Conservatives for Britain). However, as senior MP for the committee, Owen Paterson is chairing meetings and is coordinating much of the day-to-day activity.A report in The Times suggests that Dominic Cummings, former adviser to the Michael Gove, has been recruited to oversee the committee. However, at this stage, the committee has no formal secretariat. It would be quite wrong to suggest that Cummings is in charge. His precise role (if he chooses to accept one) has yet to be defined. The task of the committee is urgently to seek “to provide resources for crucial thinking and to promote cooperation amongst those who might contribute to a ‘no’ campaign”. In other words, it is exactly as described on the tin. It is exploring the terrain. It is not the “no” campaign, and is not taking an active campaigning role. Underpinning the committee is a belief that, without fundamental change in our relationship with the EU, it is the best interests of the UK, Europe, the wider world, and the cause of peaceful international cooperation, to the UK to leave the EU and pursuing a different relationship with our EU partners. However, the committee notes that “there is little if any indication that the government is even asking for significant reform or fundamental change”. In anticipation of there being no significant (or any) movement in the June European Council, therefore, the committee is taking certain preparatory steps. It is conscious that both sides of the referendum campaign will require the creation of substantial organisations to provide voters with a real choice. And in this context, it will be looking at the legal issues arising from the Referendum Bill (eg. rules for “purdah”, the impartiality of EU and government institutions and broadcasters, funding limits, designation of “yes” and “no” campaigns, etc). Specifically, the committee is also looking as how an “no” campaign might best be formed, and how it might be run to inform the public about the issues. It has been stressed that there is no intention to impose a “top down” structure on the campaign or appoint a grand supremo over the heads of campaigners. This is a genuine attempt to resolve the many complex issues involved in setting up and effective campaign. Our Referendum Planning Group (RPG) has been kept fully informed of developments, and we are in touch with key players. Our own group will be meeting in London on 30 June and we would welcome contacts from other interested groups. Alongside the Bruges Group and other component groups, we anticipate that the long-standing Campaign for an Independent Britain (CIB) will play a significant role in recruiting and marshalling “grass roots” activists. We encourage potential activists to contact the CIB or to watch this blog for further announcements – not least for details of a number of “recruitment fairs”, where we will be seeking activists to fill specific positions. Another thing we have in mind is a series of stand-alone functional “cells” to take over specific tasks, such as the social media “rebuttal group” that is in the process of formation. There will also be a number of covert groups, tasked with some other serious activities. We are encouraged that, within the Exploratory Committee, there is recognition of the need for a comprehensive, and common, exit plan – and the urgency behind the task of producing one is understood. All and any support in this respect that the Committee needs will be made available to it by the RPG. With it firmly established that this campaign is about free people cooperating freely in a common cause, we see this emergence of the Exploratory Committee (EC!) as a healthy and important step in the development of a formal “no” campaign. There has been much progress in the weeks since the election, and I am confident that we are beginning to work in the right lines. a reassuring step that would seem to be very much in the right decision to ensure that ‘democracy’ will stand a chance against the likely spread of FUD and efforts of the British Government, the EU and the parochial values of the SNP will be both exposed and countered. One is forced to the realisation that this referendum, when it occurs, will be largely invalid in democratic terms as FUD and intervention together with interference and public money will be used to distort the democratic process – with liberal spin on the non event Cameron achievements, thus negating any value in a YES vote to remain in the EU and the fractured nature of our society will continue. Thus this is little more than a dress rehearsal for the battle to come when as a result of the apparent popularity of a YES vote leads, naturally, to a rapid treaty change and central imposition of a new treaty by the EU – This will then provide the referendum of consequence prior to the binding lock in of the new treaty – a referendum promised by Government should there ever be a new treaty and or further loss of democratic powers. As with any dress reheartsal this must be used to show there is a will to continue the battle for repatriation of our sovereignty. restoration of our borders, reinstatement of our place at the table internationally in our own right and reconstruction of our Civil Service as a British administrative and negotiating force rather than the milk sops of the EU over weening unelected bureacracy, which to a large extent controls the EU. The other great benefit of a dress rehearsal will be the opportunity to learn those who are truely campaigners for Britain with a view to learning from the mistakes of the NO campaign versus the distortions of the process by the YES campaigners – sadly however there is no guarantee that the NO campaign will learn as largely they seem not to have learned from the debacle of the 1975 referendum that has provided the last 40 years of damaging vassal status and loss of our Civil Service and Government in terms of skills of drafting and negotiation on the world stage. Many of the same mistakes are being made now by those claiming to aspire to a NO vote as were made in 1975. We must use this referendum to put the NO campaign in as strong a position as we can, though I have little doubt we will lose in this round, we must learn to ensure we win in the second and dec isive referendum regarding a new treaty and further loss of powers and democratic control, that will inevitably come fairly rapidly (approx. 3>4 years after this referendum). The broader the spread of the campaign and the more focused the aims the better and it is not a leader we need as it will be the intellectual argument that will win, in a largely economically neutral debate of the values of independence of mind and values on the world stage in a largely globalised world where such individuality will prove essential – unless of course one wishes to live in an over bureaucratised bland uninovational ant colony manner on our planet. Even in the EU the true spirit of these United Kingdoms stands out, as does or versatility and ability to recover from set back in a mannert that is an example to the rest of EUrope if not the world – such that be they the boat people of Viet Nam or their current equivalent amongst the flotilla of ships adrift in the Med. on route from Africa, Syria, Iraq and the like where such an overwhellming percentage wish to head North to the Channel Ports to seek passage, however dangerous, to get into Britain. A largely unwanted compliment but a compliment no less, showing that although there are those who for their narrow aims and faltering confidence may value vassal status in the EU many around the world see Britain as a very separate entity, hence the level and diversity of those seeking assylum, for whatever reason, on these islands – different as we are. Thus I see Richard’s introduction of both the EC and the RPG as not just a small step for the NO Campaign but a giant leap forward for the future as Britain moves inexorably to BreXit via FleXcit! Fantastic news, we should be right behind them ! Sounds good – it’s good to see things moving in, what I think, is the right direction.